Posted November 30, 2017 by Chelo Grubb & filed under In the News. Reid Park Zoo is happy to announce the birth of another Baird’s tapir! The Zoo’s 15 year-old female Baird’s tapir, Contessa, and 11 year-old male tapir, Tupi, welcomed a male calf on Thursday, November 9, at 9:03 p.m and he weighed approximately 25 pounds. Zoo visitors may be able to get a peek of the newest addition to Reid Park Zoo as the animal care team allows him to explore his habitat. When not on exhibit, Contessa and her calf will remain behind-the-scenes to ensure an environment with minimal stress as he is still gaining his strength. Contessa came to Reid Park Zoo specifically to breed with Tupi as part of a Species Survival Plan®. 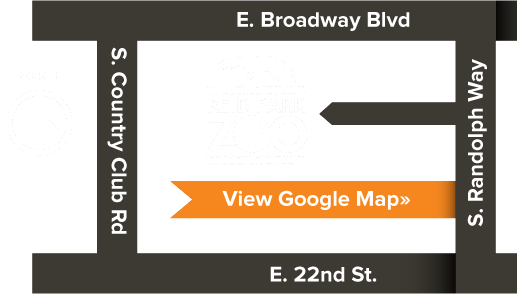 Reid Park Zoo works in partnership with other facilities accredited by the Association of Zoos and Aquariums (AZA) to cooperatively manage threatened and endangered species. This calf comes after Toliver, Contessa and Tupi’s last calf born in 2015, was transferred to Africam Safari in Puebla, Mexico as a breeding recommendation from the AZA. Both of these births demonstrate Reid Park Zoo’s strong commitment to the conservation of wildlife. The Baird’s tapir is classified as Endangered on the International Union for Conservation of Nature Red List. Due to the low reproductive rate, the Baird’s tapir is particularly vulnerable to disturbance such as habitat loss. UPDATE: On December 15, 2017, it was announced on our Facebook page the winning name of this male tapir is Iibu (pronounced Ee-Bo). Reid Park Zoo Keepers and Christopher A. Jordan, a researcher for the Baird’s Tapir Project in Nicaragua, helped us select three names which the community then had a chance to vote. With 1,969 of the votes, Iibu won the majority! Iibu is the name of a fruit tree tapirs eat in the Rama indigenous language of Nicaragua. Iibu is still gaining his strength but may be seen on exhibit when temperatures reach above 65 degrees.